Marc and Kristen's charming 1920s home, located in the historic Kessler Park neighborhood of Dallas, has been a labor of renovation love for the sweet couple over the years. With Kristen's eye for interior design, they've slowly made the home fit their cool asthetic. 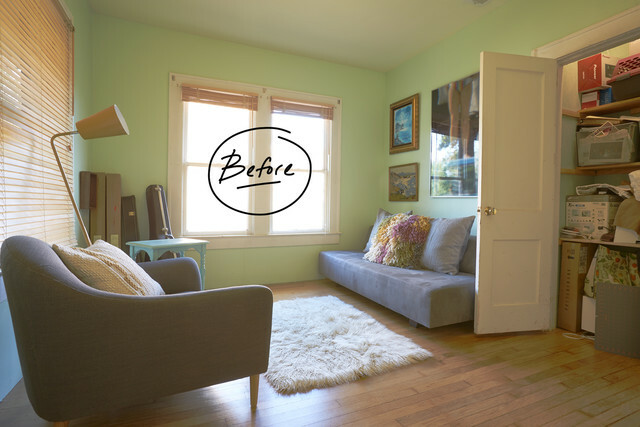 The room that was designated as the nursery had many uses over time - it has served as a music recording room for Marc, a guest room, a dark room for his photography and space for yoga and meditation. The creative couple knew the vibe and feel they wanted to evoke, but the project was a bit complicated when Kristen was put on bed rest for the last two months of her pregnancy. 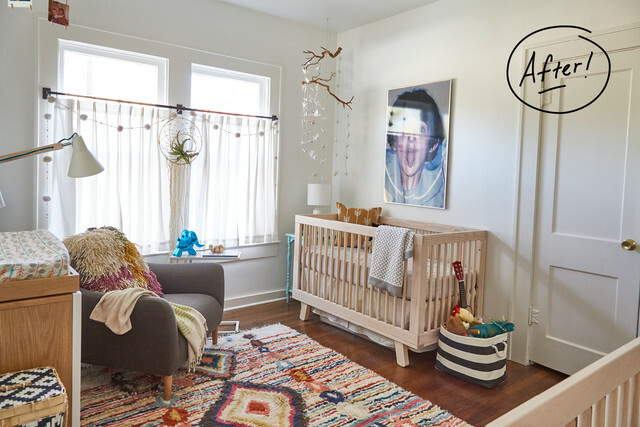 But with a little help from their friends and with Marc leading the charge under Kristen's artful direction - the end result became a precious, eclectic nursery that is full of funky, sophisticated fun, mixed with warm, thoughtful touches. 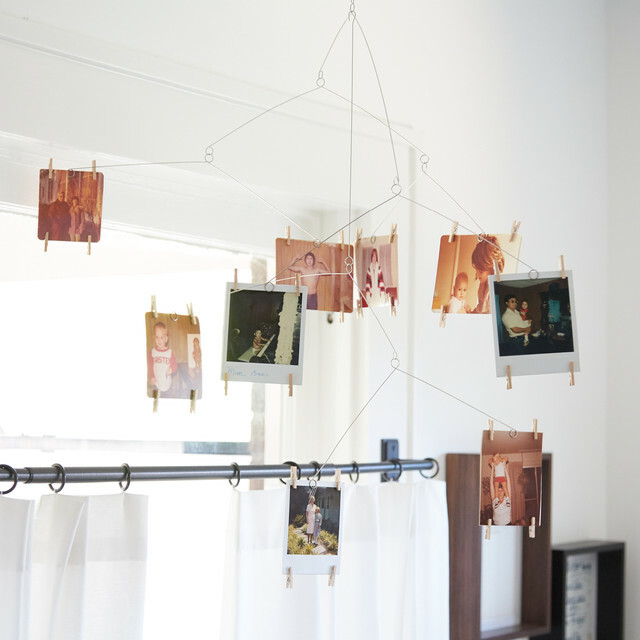 The large scale, whimsical photographs hanging over each crib are from a series that Marc did in college where he re-photographed old family photos. One features a child sticking their tongue out, and the other is of some sweet feet on a diving board ready to make the leap. 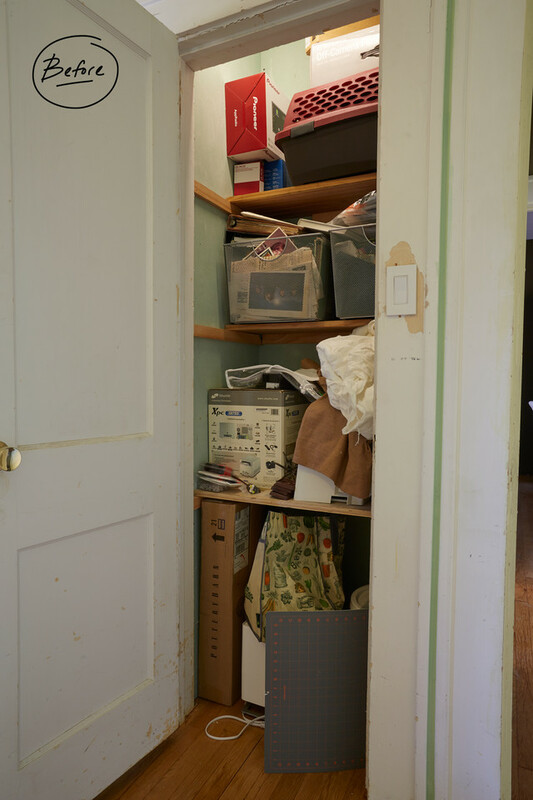 The small closet in the space was full of a myriad of items that reflected the room's variety of previous uses. It was packed to the gills with no sense of order or organization. 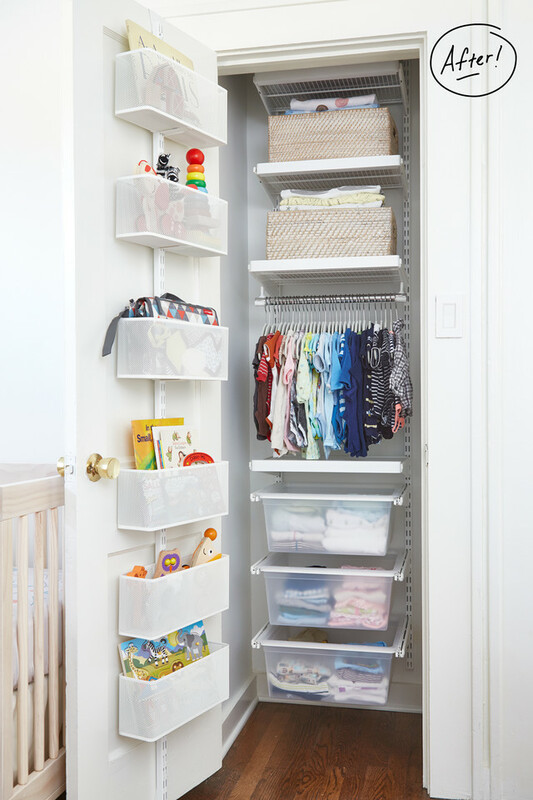 The babies' closet was transformed with elfa, utilizing every bit of space. 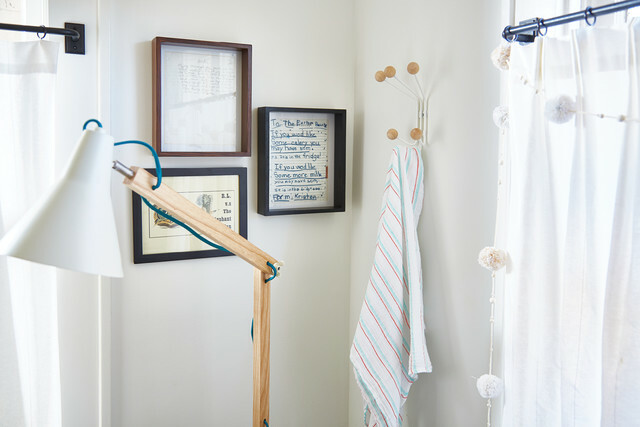 The elfa door and wall rack maximizes the closet and holds the twins' toys and books. 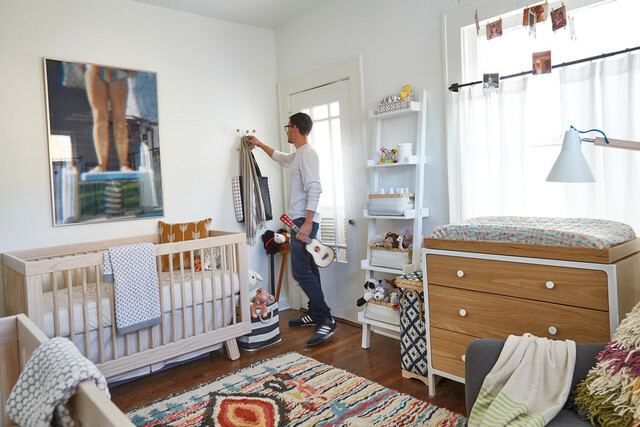 The hanging space and drawers are perfect for the tots' tiny wardrobe and gives the couple flexibility to rearrange things as the babies grow. "Our dream is that when the twins are older, they'll be able to pick out their own outfits or pull out toys using the bins and drawers in the closet and clean up afterwards thanks to the organization inside," said Kristen. 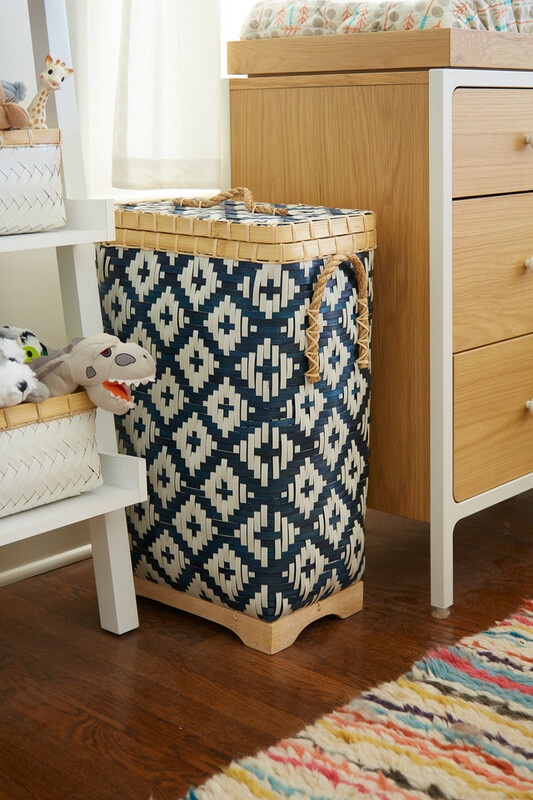 Marc and Kristen love our Diamond Bamboo Hamper and it's become a beautiful focal point in the room that's strategically placed next to the changing table. 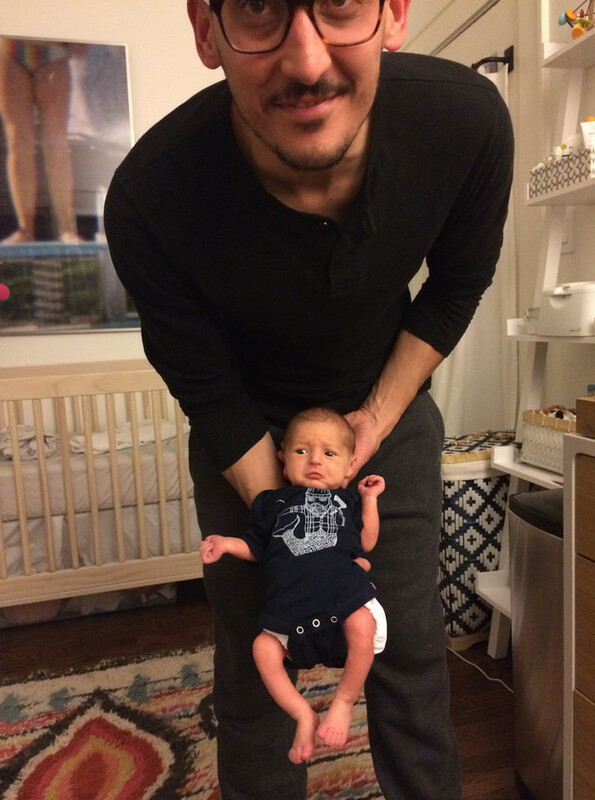 They say they love it, but joke that it's used more often than they would like, as it currently works twice as hard with the laundry that comes along with newborns. 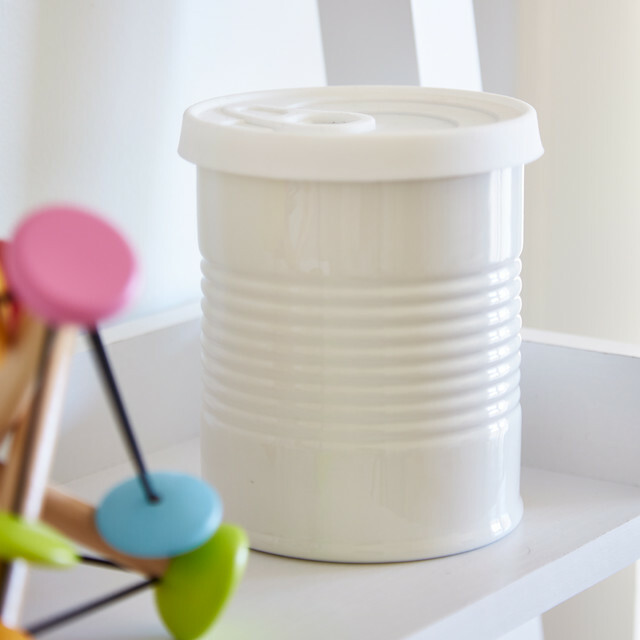 The changing table does double duty as a chest of drawers which are thoughtfully organized with a ‘his' and ‘her' side. 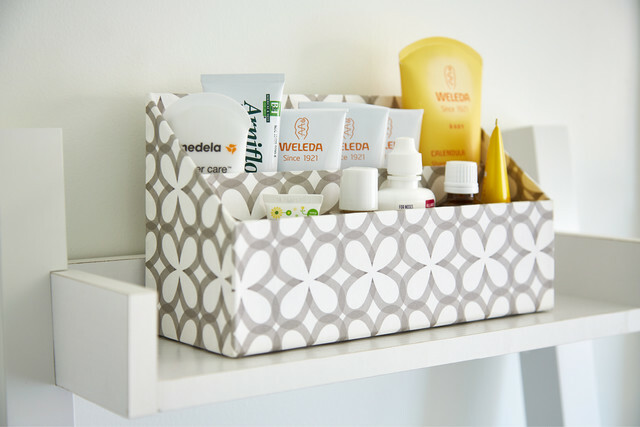 Marc says the Linea Leaning Book Shelf stationed next to the changing table serves as "command central" holding everything from bottles, lotions to diapers, wipes and small toys. 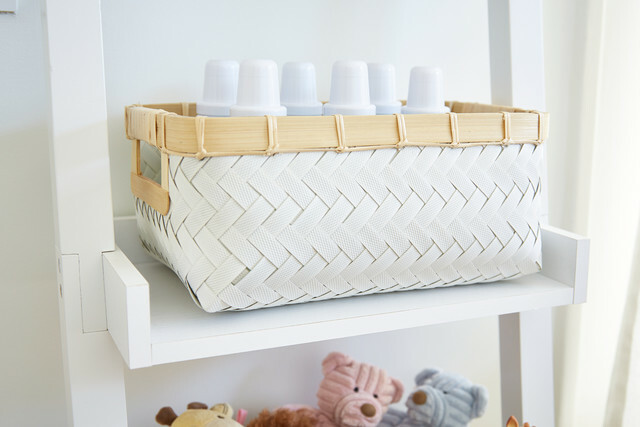 Clear storage boxes stored under the crib provide smart, extra organization - a great use of underutilized space. Artwork throughout the space is carefully curated and personal. The lovely touches include a poem that Kristen's brother wrote when he was little and a note that Kristen wrote the Easter Bunny as a child. 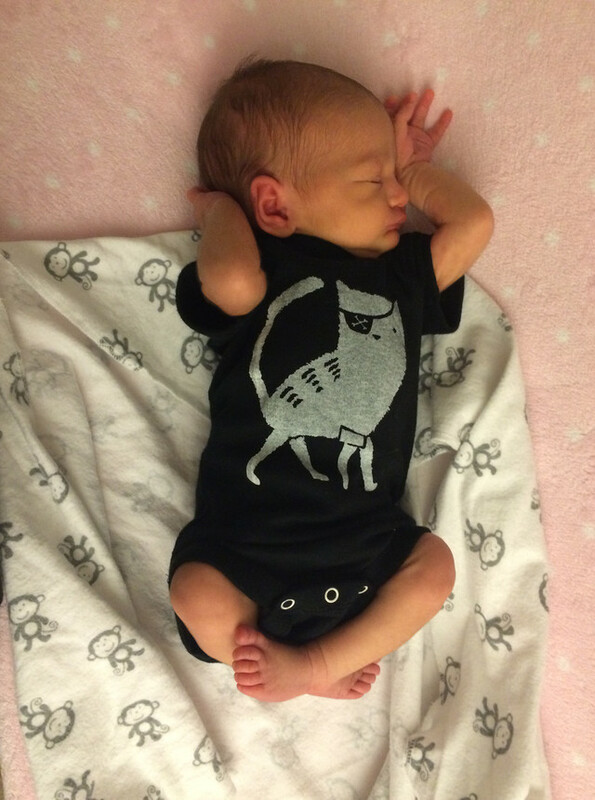 The unique mobile hanging over one of cribs tells a special story. With the help of friends and family, the couple created 1,000 origami paper cranes for their wedding. Kristen said the cranes are based on the Japanese story of the paper cranes representing good luck - a sign of goodwill and hope. 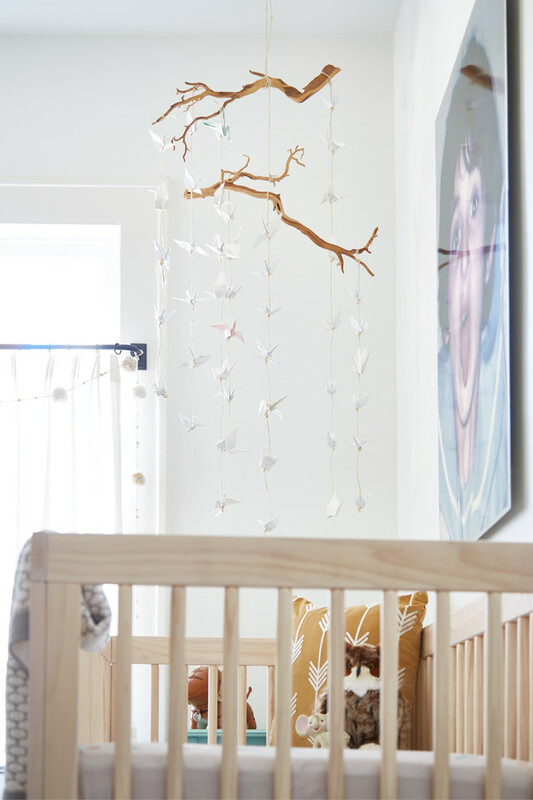 They thought it was only fitting to create the mobile with the cranes to symbolize the love and care the new family is surrounded by in their home. Kristen and Marc said they are so thankful for the friends and family who helped them get the space in tip-top shape and ready for the twin's arrival. And they love the transformation. 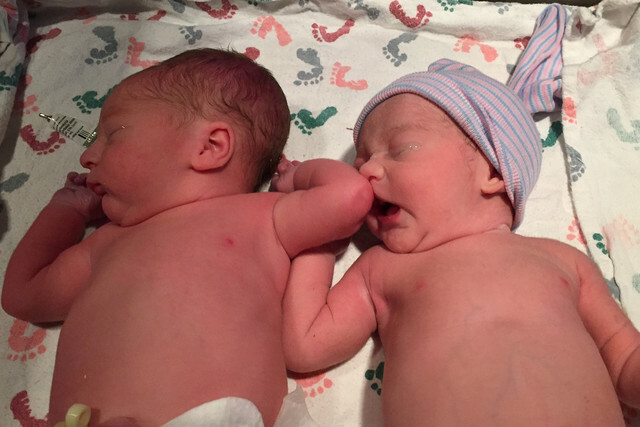 But the big reveal though - the two precious additions to the family: Penny Rose and Buddy Owen! 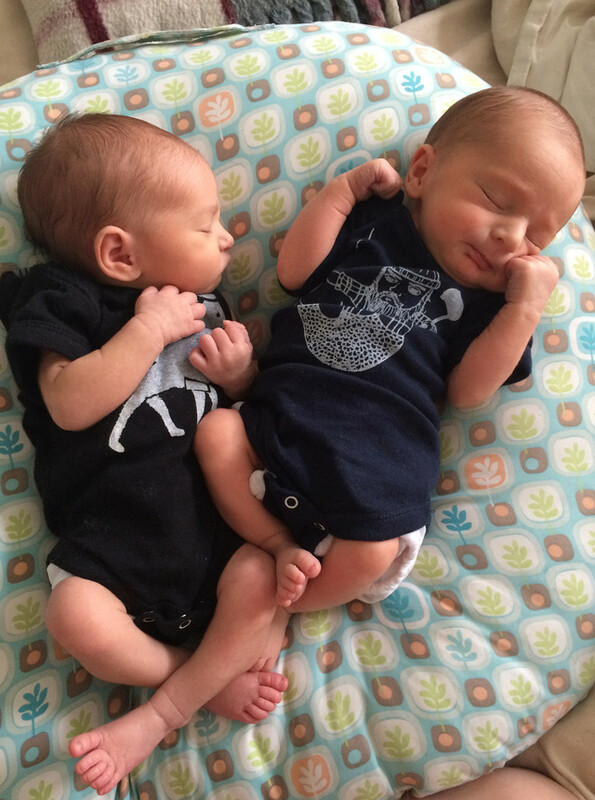 Now just about three weeks old, they say the twins have very different, distinct personalities. "Penny always has her eyes shut like she's laughing about something; very tentative and thoughtful. Buddy always has a wrinkled brow and looks a little worried," said Kristen. 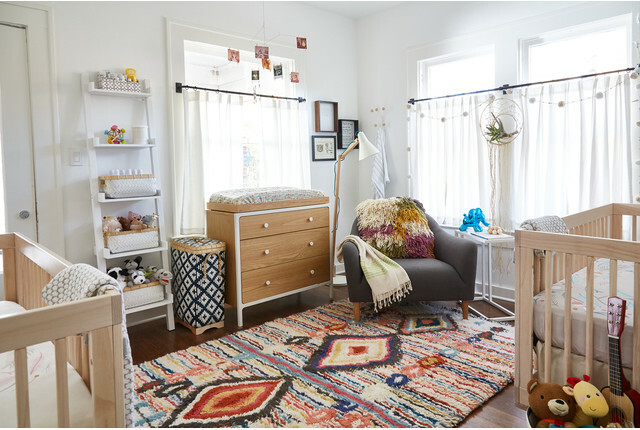 She gushes about the nursery and the fact that it's a lovely, serene space they all enjoy spending time in. "It now feels like a little oasis - it's a magical and place you never want to leave."